Start your journey toward health and fitness. These two businesses, a combination of physical and mental health, serve as an excellent compliment to each other. Bushin Kan Karate began as a way for students to develop an awareness of their bodies and of their ability to protect themselves. Later, as more fitness courses began to take root a broader, more versatile approach to wellness began. This new, developing system became perfectly rounded by OBX Body Works, a massage therapy business designed to help clients relax and rejuvenate from the stress and physical demands in their daily lives. The three components to these businesses: karate, fitness and massage provide a unique and wholesome experience for the entire family to enjoy. -Susan Reynolds, student since 1988. 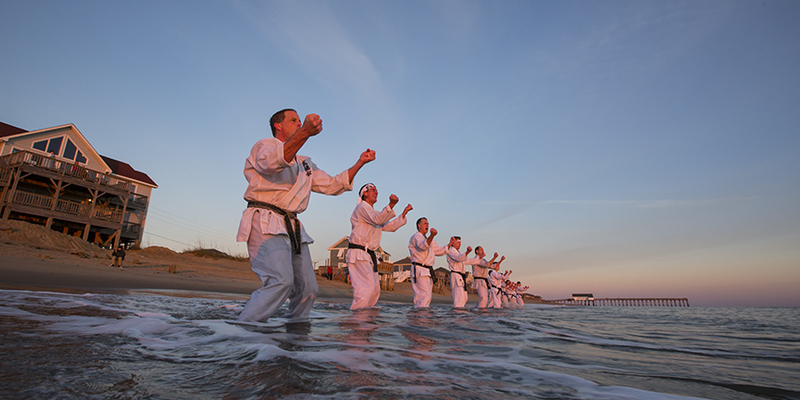 Bushin Kan Karate and OBX Body Works are operated and owned by Keith Seal. Keith started his business 30 years ago with the desire to help others realize their health and fitness goals.